Share the post "Signs of Life"
Just these past few days of mid 30’s temperatures I have noticed how the snow is slowly and gradually melting. In spite of it being chilly and windy, we should be thankful that the snow lines are receding slowly as we could easily have had flooding from this winter’s snow accumulation. I’m also glad to see the frost slowly going out of the ground as well. As far as the real estate market, I’ve had listings and sales this past week and working on another offer as I speak. Seems there was some pent-up home buying desires over January and February that are becoming evident now. The interest rates are still near record lows and many of the homes are priced in a range where it would be foolish not to buy as a great number of tenants are paying more for rent than their total payment would be if they were to purchase. I think the fear factor is still lingering with many people over what happened in the financial melt-down of 2007. Those were days when credit standards were too loose. I used to say that if someone had a heartbeat and could sign their name, they would likely get a loan. That was a very bad time and I didn’t agree at all with those types of lending standards. I knew there would be people setting themselves up for failure. I happened to notice a foreclose today that a young man purchased for $100,000 in 2006. It is listed at around $50,000. I can’t wait until all the toxic assets of those years are all sold so we can get back to normal market conditions. Listed and sold foreclosures pollute market values and leave a negative back-lash for normal sellers trying to get a fair price for their homes. 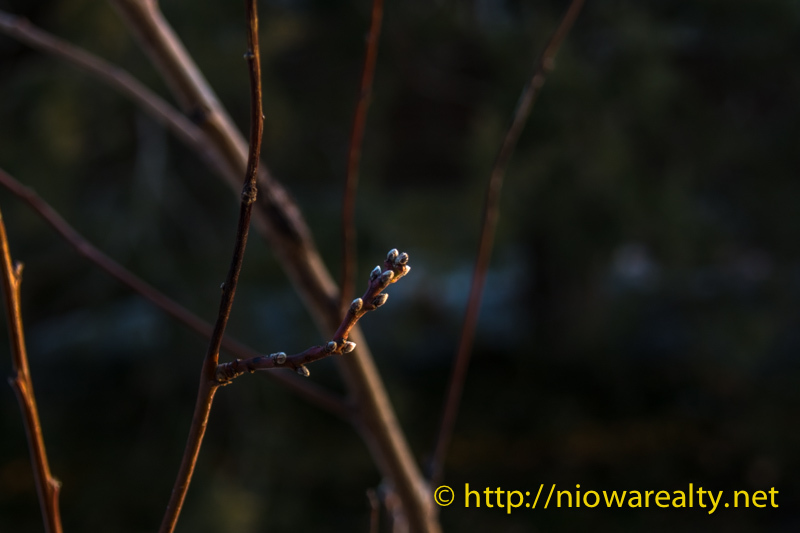 I went for a short stroll today and found a fruit tree that is starting to bud. Looks like Mother Nature managed to protect the trees from the terribly lows temperatures this past winter. In nearly all areas of our lives, it’s always good to see signs of life.